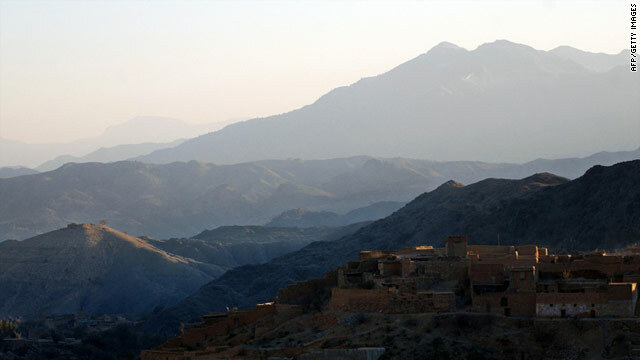 Mountains in the tribal area of the Khyber Agency near Pakistan's border with Afghanistan, pictured in 2008. Islamabad, Pakistan (CNN) -- The death toll in Friday's three drone strikes in Pakistan's tribal region has gone up to 57, intelligence officials in Pakistan told CNN on Saturday. Two intelligence officials say 15 suspected militants were killed in the first drone strike, which targeted a militant hideout. The second drone strike, which also targeted a militant hideout, killed 17 other suspected militants. In the third, which targeted a training camp, 25 suspected militants were killed. The three assaults occurred in Tirah Valley of Khyber Agency, one of the seven districts of Pakistan's volatile tribal region bordering Afghanistan. U.S. forces are suspected of carrying out the strikes. The officials say all three occurred in an area of 4 square kilometers. The intelligence officials asked not be named because they are not authorized to speak to the media. CNN's Chris Lawrence and Nasir Habib contributed to this report.